Preheat oven to 350˚. Roast sweet potatoes until tender, about one hour. Grease a 2 quart casserole with butter and set aside. Place peeled, cooked sweet potatoes in a large mixing bowl, and using a hand or stand mixer, mix at medium low speed. Add orange juice, eggs, melted butter, sugar, cinnamon and nutmeg, then season with salt and pepper. Mix until fluffy. Transfer sweet potatoes to prepared casserole dish. In a small bowl, mix together the flour, brown sugar, and cinnamon. Cut the butter into the flour mixture until it resembles oatmeal in consistency. 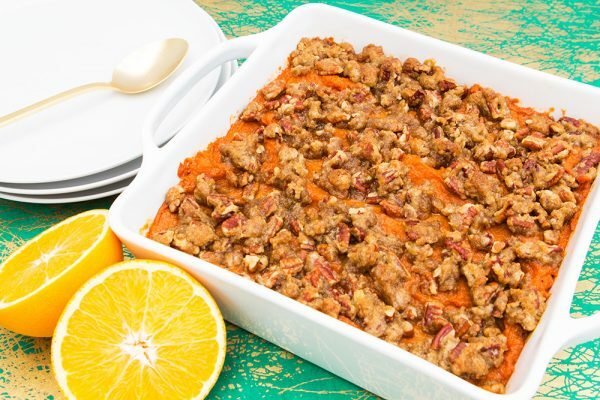 Stir in the pecans and sprinkle the topping over the sweet potatoes. Bake in the oven until the topping is dry and toasted, about 30 minutes.